Home / Local News / Education / No bad schools! Prime Minister Freundel Stuart says as far as he is concerned, there are no bad secondary schools in Barbados. Speaking at the 2016 graduation ceremony of the Reynold Weekes Primary School, held at the Barbados Workers Union Labour College, Mangrove, St Philip, Stuart told the graduands that no matter what school they would be attending, they could make something good of their lives. Prime Minister Freundel Stuart (left) in conversation with Principal of Reynold Weekes Primary School Anderson Bishop at the school’s 2016 graduation ceremony. “The teachers in our schools went to various schools across the island, and, therefore, when you sit at their feet in classrooms, what you are doing is partaking of the culture of a large number of schools across Barbados. “So don’t allow anybody to confuse you with the view that if you didn’t get into the school of your choice that you have failed. None of you in this graduating class this morning is a failure. All of you have the opportunity to be the best you can be,” he said. The Prime Minister, who attended St Martins Four Roads, which was the forerunner to Reynold Weekes, also urged the young Barbadians to aim for excellence through hard work and diligence. Female graduands dancing to Reach. As they prepare to begin a new chapter in their school journey, Stuart called on them to make positive choices, including being respectful to teachers and forming relationships with the “right” friends. The Prime Minister also told them that no matter what they achieved in life, they should never see themselves as more important than others. “No matter how far you reach in life, no matter how great you become in life, understand a great person should never mind stooping,” he said. Stuart also told the students they must be cautious what they consume through their eyes and ears. He said unlike the mouth, which rejects anything it does not want, consumption was not the same with other body parts. “If it is the wrong thing, you are going to be contaminated for the remainder of your life. Therefore, you must be very careful what you set out to see and what you set out to listen to,” he advised. “And you can freely take that advice from the Prime Minister of Barbados this morning, because I don’t allow my ears to hear everything and I don’t allow my eyes to see everything. “There are a lot of things that are said around me that I hear, but for consumption, I am not interested in,” Stuart emphasized. Delivering his report, Principal Anderson Bishop revealed that Reynold Weekes performed exceptionally well in this year’s 11-Plus examination. He explained that while the national mean was 116.22, the school’s mean was 134.47. Most Outstanding Boy in the11-Plus Examination at Reynold Weekes Primary School. Overall, the school also performed better this year in the Common Entrance Examination than last year. However, Bishop acknowledged that the girls outshined the boys, while suggesting there was need for further investigation by education authorities of this trend, which he said was cause for concern. He also suggested that gender biases in the classroom needed to be looked at. 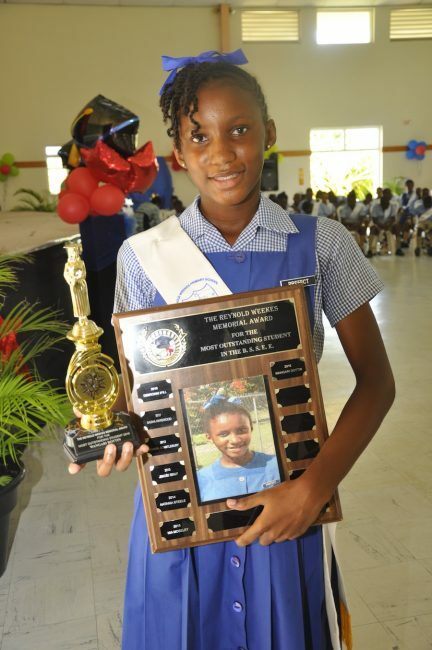 Wangari Dotton received the prizes for the Most Outstanding Student in the 11-Plus Examination at Reynold Weekes Primary School. This year’s top female student was Wangari Dottin, while Jonathan McCollin was the school’s top boy. Why do I think that this message was not so much for the graduands as for the ‘noisemakers’?